In honor of Independence Day, here is the passage from the end of my novel The Queen City: The Marquette Trilogy, Book Two, depicting the 100th anniversary of Marquette and Fourth of July Fireworks. Happy 4th to all! 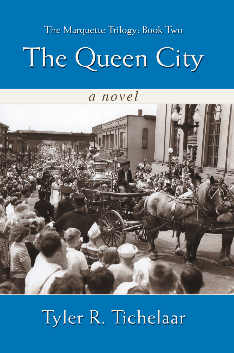 The Queen City: The Marquette Trilogy, Book 2 covers Marquette’s history from 1902 until the 1949 centennial celebrations. In small towns, people depend on each other. In Upper Michigan, through long, harsh winters and economic woes, people form bonds even without blood ties. On this day of civic pride, an entire city became one family, a city filled with people descended from a handful of brave pioneers who came to Iron Bay a century before to build a community which still prospered. Even Jimmy Whitman, who today would rather be in California, and as an adult would live miles from Marquette, would in later years look back on this day with fondness. The picnic broke up all too soon as everyone looked at their watches and realized it would soon be time for the fireworks. People went their separate ways. Bill wanted to be alone with Sally. Thelma was tired so Jessie brought her home. Harry Jr. had promised to take his children over to a friend’s house. Some decided to go home rather than attend the fireworks, but Sylvia insisted on seeing the finale of the city’s celebrations, and Eleanor, finding her daughters’ enthusiasm matched that of her aunt, agreed to take them all. Margaret told Roy he had no choice but to drive her to Memorial Field for the fireworks. “It won’t hurt you to take me and then stay at your mother’s house another night before going back to that old cabin of yours,” she insisted. Roy knew better than to argue. Henry and Beth talked Michael into piling into their car with the children. Then they followed Roy’s vehicle while Eleanor and company brought up the rear. Once the three automobiles reached Memorial Field, the Whitman clan found thousands of people crowded together, eagerly awaiting the finale to the centennial celebrations. The Boy Scouts of Racine, Wisconsin entertained the crowd with their drum and bugle corps. Then a Vaudeville show made the crowd laugh and join in singing. Eleanor and Beth chuckled, knowing this comment was pointed toward Bill’s girl Sally, who had come to the picnic with her knobby knees on full display. Sylvia could not finish her sentence but just shook her head. “Is the house still there?” asked Henry, his carpenter instincts awakening. “Oh, yes.” Sylvia described it until Henry suspected it was the same as Robert O’Neill’s house, where he had fixed the porches during the war. “Aunt Sylvia, why did your grandparents move away?” Lucy asked. Everyone nodded in agreement, but writing Marquette’s history seemed too daunting a task for any of them. Not one felt confident with pen and paper. Everyone greeted Fred. Introductions were made and remarks exchanged about how impressive the parade had been. Then Fred said goodbye and walked away. One day, Fred Rydholm would pen two mammoth volumes detailing the history of the iron ore industry, the founding of Marquette and the Huron Mountain Club, and the Upper Peninsula’s important role in American history. “How long before the fireworks start?” asked Ellen. At that moment, the first loud cracking thunder broke. Memorial Field was packed with thousands of city residents and visitors who lifted their eyes to the glorious explosions in the night sky. Pink blazing sparks spread in every direction. Then a burst of blue, an explosion of green, a shot of white, a spray of orange, then yellow, then blue again, and red, and green, and blue, and orange, and yellow, and pink, and white. Burst after burst, straight firing white lines, kaleidoscopic green, pink, purple, all at once. One separate firework to mark each year of Marquette’s history. Up into the sky they shot in shimmering streaks like a hundred candles blazing on a bombastic birthday cake. Ellen covered her ears; the fireworks were so delightfully loud. Henry leaned over to kiss his wife’s cheek. “Shh, Daddy, you’re missing the fireworks,” Ellen scolded. Henry and Beth both chuckled, glad to see their daughter happy. They were happy themselves. They were back where they belonged, in their hometown for its centennial, which they would not have missed for anything. Henry thought back on all of Marquette’s remarkable history, the raising of the courthouse, the library, the banks, the houses, the bravery of its people, the struggles through fires and blizzards, economic woes and wars. He thought of the ore docks, those formidable giants of the iron industry, stretching out into the world’s greatest lake as emissaries to distant lands. For a hundred years, from Iron Bay, the Upper Peninsula’s riches had been shipped out to bolster a nation, yet Marquette had scarcely received mention in a history book. Many people could not even pronounce its name, much less find it on a map. But its Northern sons and daughters knew the great privilege they shared in living here. They knew Nature had blessed them by giving them this land of pristine beauty, mighty forests, fresh air, and remarkable weather. Henry and Beth were grateful to have been born here, and thankful they had been wise enough to return. Thousands that night felt in their hearts what Henry spoke as he turned to Beth. You are currently browsing the MY MARQUETTE weblog archives for July 2015.